Review In A Nutshell: Rosemarked is a fantastic YA fantasy for someone looking for political intrigue, a complex and fascinating world, and amazing characters. Rosemarked is told in dual-POV, following Zivah, a healer forced to live in isolation after falling ill to the rose plague and ending up rosemarked, and Dineas, a rebel warrior desperate to free his tribe from the Amparan Empire. Together, the two embark on a mission to gather information on the Amparan Empire. This fantasy world is beautifully crafted. It has no magic or paranormal aspects but instead is focused heavily on politics and war. The healing in this book was the closest to magic there is. It was fascinating to read about, and very well developed. I haven’t read any of Livia Blackburne’s books before this one, but I’m thinking of giving them a try. This book was well written. The writing style was easy to understand and jump in to, but still elegant and beautiful. The plot is the only area of this book I didn’t love. Mostly, it’s slow. There’s some action in the beginning, and action at the end, but the middle is focused more on political maneuvering, spying, and character development. That said- it is still absolutely amazing if you’re willing to push through. It discusses a lot of heavier themes– PTSD, ethics in war, etc– and handles them beautifully. The characters in this book really stand out. Zivah is an amazing protagonist. I loved seeing her wrestle with her beliefs as a healer while also trying to help Dineas and fight against the Empire in her own way. Dineas is definitely a complex character. He is willing to sacrifice everything to protect those he loves, even his sense of self. Their relationship was absolutely beautiful. It was definitely a slow-burn, and very subtle in comparison to your typical YA novel, but I adored it. It takes a back seat to the rest of the plot, but the scenes between the two characters, and their dynamic was one of my favorite parts of the book. Also, there is some LGBT rep (YAY), and adorable animal sidekicks that I really wished I could have. Nothing is better than a pet snake, or highly trained crows. Pros- Amazing and complex characters, deep themes, fascinating world. 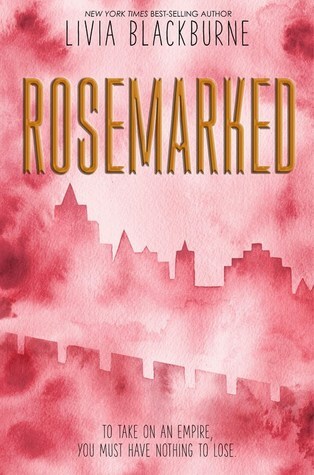 Rosemarked is the type of book you love more and more every time you look back on it. If you’re willing to dedicate yourself to this story, you will fall in love with every page.